Top stacks of oven-fried eggplant with fresh tomato sauce and mozzarella and Parmesan cheeses to make a satisfying summertime vegetarian dinner. 1 of 1 Heat oven to 400 degrees F. Peel papery skin from head of garlic. Cut 1/2-inch slice from top pointed end of garlic. Coat cut end of bulb with nonstick cooking spray. Wrap in foil and roast in 400 degrees F oven for about 1 hour or until cloves are soft and golden brown. Set aside. 1 of 3 On sheet of waxed paper, mix together bread crumbs, salt, pepper and nutmeg. In pie plate or large shallow dish, lightly whisk the egg whites with 1 tablespoon water. 2 of 3 Coat large baking sheet with nonstick cooking spray. Dip each slice of the eggplant into egg whites and then into the bread crumb mixture, coating both sides. Place eggplant slices on prepared baking sheet. 3 of 3 Bake in 400 degrees F oven for 45 minutes until nicely browned and tender. 1 of 2 In small bowl, combine the grape tomatoes, sliced basil, oregano, salt and pepper. 2 of 2 Overlap the eggplant slices slightly on the baking sheet into 4 stacks, about 3 slices per stack. Spoon the sauce over each stack; evenly sprinkle mozzarella and Parmesan cheeses over the tomatoes. 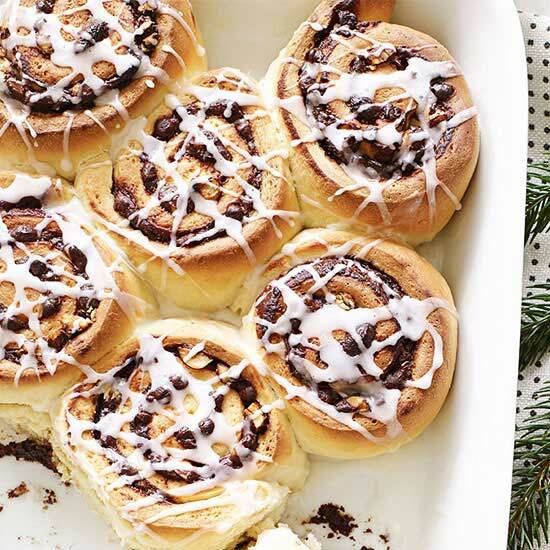 Bake an additional 10 minutes. 1 of 2 While eggplant is baking, squeeze roasted garlic cloves out of the whole head and into bowl; gently mash cloves against side of bowl with fork. Whisk in balsamic vinegar, salt, pepper and oregano until fairly smooth. Gradually drizzle in olive oil, while whisking continuously. Set aside until eggplant has finished baking. 2 of 2 Toss greens with vinaigrette. 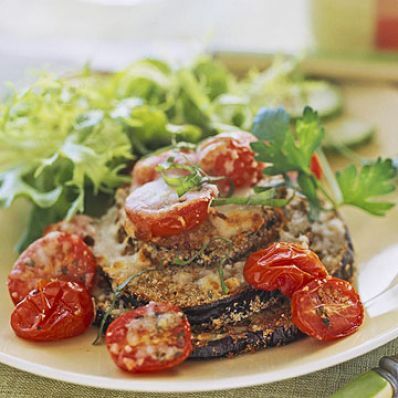 Serve 2 cups dressed salad with each eggplant stack. Garnish with additional basil, if desired.